otal of 232 lots had been sold within the new community. Prescott was officially incorporated in 1883. 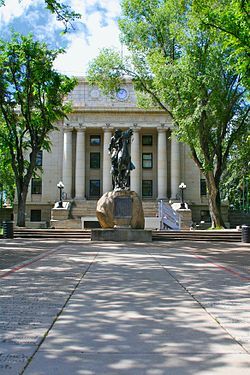 Prescott is located in the Bradshaw Mountains of central Arizona, at an altitude of 5,400 feet (1,600 m). The city has what is classified under the Köppen climatic classification as a Mediterranean climate (Csa) owing to its relatively high rainfall and dry early summer period, with mild to cool winters and warm to hot summers. Average annual precipitation for 1981–2010 is 17.75 inches (451 mm), with spring and early summer the driest times of the year. Snowfall is typically light and snow cover usually melts away quickly; the 1981–2011 average seasonal total is 12.8 inches (33 cm). Despite the Csa classification, the largest portion of precipitation falls during the July–September monsoon season. Average daytime temperatures remain above 50 °F (10 °C) the entire year, but diurnal temperature variation is large throughout the year, averaging nearly 30 °F (17 °C) annually. On average, temperatures reach 90 °F (32 °C) on 36 days annually, though 100 °F (38 °C)+ readings are uncommon and do not occur every year, much unlike the Sonoran Desert to the south and Mojave Desert to the west. The average window for freezing temperatures is October 21 thru May 1.